What's the deal with... The Awesome Adventures of Captain Spirit? Life is Strange 2 prequel is free to play now, but who is Captain Spirit? Sometimes in our search for entertainment we encounter something that affects us very deeply: a scene in a movie, the line of a song, a simple painting, the use of just one color. At first glance, DONTNOD’s 2015 masterpiece Life is Strange is a point-and-click adventure about some kooky college kids in the Pacific Northwest. As any fan will tell you, that simple perception is soon swept out to sea, and over time we are drowning in emotional upheaval. 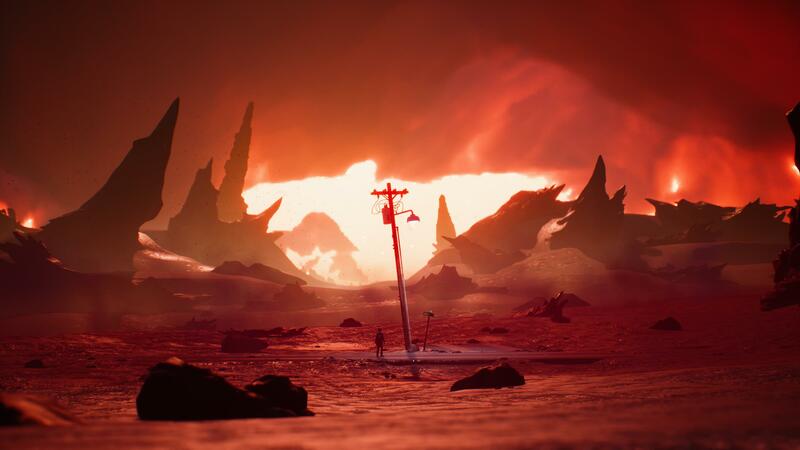 Life is Strange became more than a game – it is an important, very meaningful work of art. The Life is Strange sequel is coming later this year, but beforehand DONTNOD is releasing this free-to-own prologue of sorts: The Awesome Adventures of Captain Spirit. Available to download from June 24 on PlayStation 4, Xbox One and PC, this is our opportunity to step into the world of Life is Strange 2. However, characters and events in Captain Spirit are not directly linked to Max Caulfield in Arcadia Bay, even though this short episode does take place not far away. The Captain Spirit of the title is, in reality, 10-year-old Chris who lives with his dad in Beaver Creek, Oregon. Chris lost a caring mother, while dad lost his soul mate, to an accident not long ago. Dad comes to terms with pain in his own way; beer for breakfast, ball game on TV. Chris transforms the family home into a world of adventure, placing himself at the center of an imaginary universe. Captain Spirit is Chris’ alter ego, his toys are his allies, and domestic appliances become monsters from another realm. The mysterious Mantroid is his nemesis. Through Chris, we explore the house and flit between various imaginary thresholds, from something as simple as using powers to turn on the TV (actually a remote behind his back), to defeating Snowmancer (a snowman) with the assistance of Sky Pirate (a teddy bear) on overwatch in the Flying Fortress (tree house). Occasionally Captain Spirit crosses paths with dad, bringing Chris back to reality with a bump. Breakfast isn’t how mom used to make it, and dad’s attempts at role-play aren’t that great. “Milk mission accomplished,” he says to a quizzical expression on his son’s face. Actually dad’s a good sport, but needs his alone time. The purpose of this curious excursion from DONTNOD is to fulfil an important mission as Captain Spirit, which for the most part involves assembling an appropriate costume from odds and ends around the house. Players get a small say in how this turns out, choosing a mask or helmet, light or heavy armor, bright and colorful or dark and mysterious. 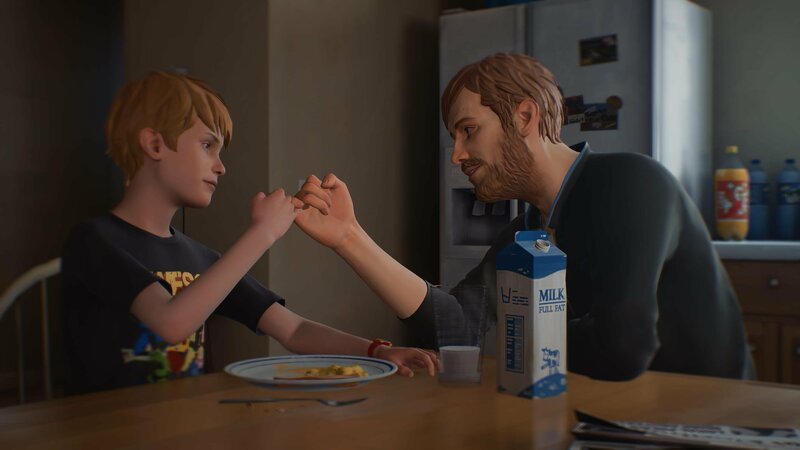 There’s definitely something psychological at play, and DONTNOD has said that decisions made in Captain Spirit will affect our experience of Life is Strange 2, though they are not essential. On one level, we find ourselves drawn completely into Chris’ world, wishing to see how everything turns out. There are some heart rending twists to the tale, and we have seen events taking fantastical turns, transporting players fully into Chris’ nightmare dimension. Meanwhile, as fans of Life is Strange, we busy ourselves scouring for clues to the next game while encountering nods to the past – like discovering that Chris’ mom studied at Blackwell Academy, same as Max and the gang. We do feel connected, through the ambience alone. 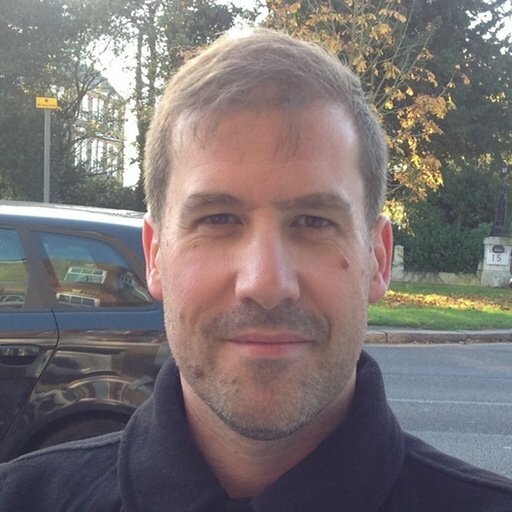 The core team of co-directors Raoul Barbet and Michel Koch with writer Jean-Luc Cano have been evolving Life is Strange 2 for the past three years. Captain Spirit emerged from their exploration of new cast members, and they realized that they could tell this unique story. Part of that is how the team has wistfully incorporated the music of singer-songwriter Sufjan Stevens, whose song “Death With Dignity” drifts into focus throughout the story, key lyrics highlighted according to Chris’ actions. It’s a very personal song about Stevens’ own mother. Meanwhile, technical talk is less boring when you see how this transpires as reworked facial animation and the immersive benefits of more realistic physics. Dad has a certain look in his eye, sorrowfully pulling up a chair, rather inelegantly to sit down at the breakfast table. The light in the kitchen is harsh and revealing. In the garden the glistening snow is more magical. Mostly, this is a fan’s opportunity to reacquaint with DONTNOD’s particular way of doing things, that often excels in those scenarios that are slower paced, cherishing the moment. The Awesome Adventures of Captain Spirit is expected to take between 1-2 hours to reach completion upon first play-through. It’s likely that fans will take much longer, rummaging through boxes and wardrobes, throwing snowballs in the garden, firing foam-darts at dad. There is more to see on repeated play-throughs, related to how we see Chris as the Cap. DONTNOD says not to strive for multiple endings, just enjoy this taste of Life is Strange 2. 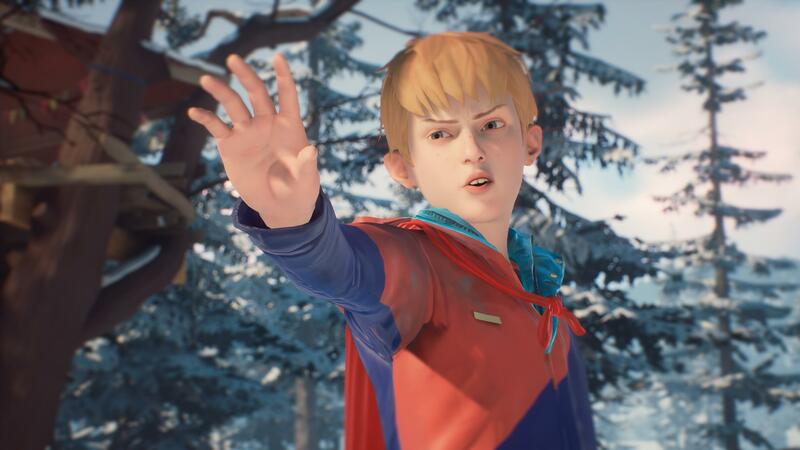 We’re not sure if DONTNOD and publisher Square Enix had released Captain Spirit with a price attached, whether this would’ve deterred series fans. The gesture is appreciated on the whole as an opportunity for just about anyone to sample the good stuff that DONTNOD has been brewing for many years now. 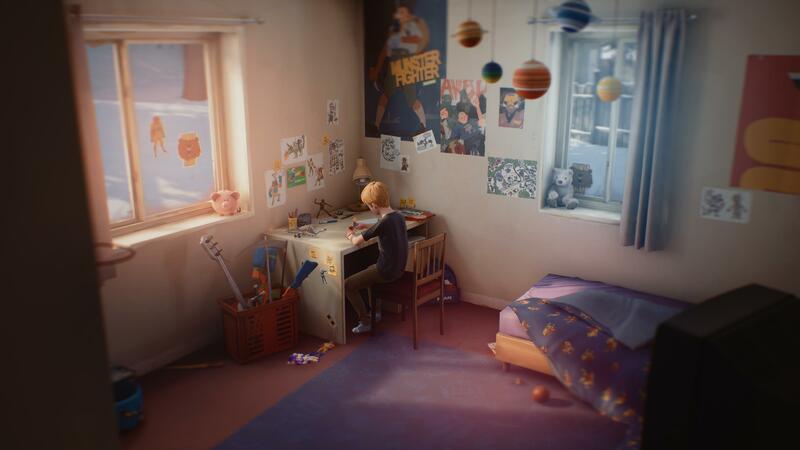 Just because this tells the story of an endearing kid, doesn’t mean that Captain Spirit is kid’s stuff. Adults, especially those with families, stand to gain even more from this from a parent’s perspective. It’s going to be really interesting to see the reactions after the game's release. If you think you can hold yourself together, give this a try.